I have several 400 ft rolls of 16mm Vision 3 500, 250 and 50 film that have been in my freezer for about 5 years. I am about to take a chance on using this stock although a test would likely be smart. Didn't realize there are now broadcast restrictions on s-16. Back in 2006 film still had the advantage. This project will not be broadcast in any case. 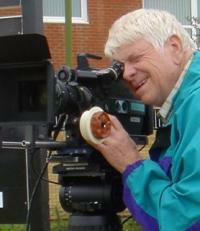 Way back in 2006 I started back into the doc film production business. I had been in it 20 years before and then was shooting 16mm and editing on a Moviola! Bought a very nice used SR2 in 2006 after soliciting opinions on this forum about film or digital. I started shooting a 1 hr doc that Is just now going into editing. Seven years of shooting! Duration was framed by the subject. First third was S-16 then XD cam shooting with an EX3 and Canon 60D. Looking now at a new project for a municipality about historic properties and am wondering if I should try to push the project into film acquisition. The editor who is cutting my 1 hr doc is not as old as I am but he is a real pro and his eyes lit up upon mentioning the idea of shooting again in S-16. Everyone i know in the business is now shooting digital but I still have the film gear. Nothing I'd like more than to resurrect it, because this is the kind of film someone might want to look at 20 or 30 years down the road. I still like the look of film better than HD and then there's the archival thing. Maybe not rational, but. The budget for this project is going to be around 150k so i think I can afford film, but what do you think? I know i'll be taking money out of my pocket and putting it into film,processing and transfers but at my stage in life.... why not? Playing HDV on a laptop monitor. Is film archaic and about to die? Many thanks for the response. I have invested a lot in working in this format and have had no problems at all other than the ones one might expect to encounter after returning to a business I left 25 years ago! Mixing film with video was never my intention going in, but the definition of HDV and the 16X9 common aspect ratio seem to make the combination quite compatible. It's interesting that people who may have a lot of video editing experience with DV feel qualified to project dire warnings about a system they've never worked with.